Anna Kastly was born circa November 1879 at Wisconsin. She was the daughter of Jacob Kastly and Josephine (?). 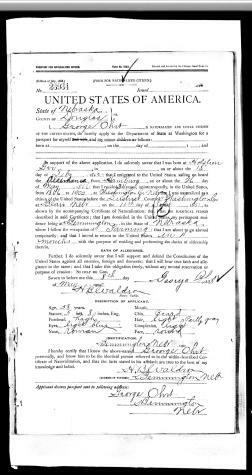 [S246] U.S. Federal Census 1880 U.S. Federal Census, by Ancestry.com, NA Film Number T9-1434 Page Number 30C. Julia Kastly was born circa 1858 at Wisconsin. She was the daughter of Jacob Kastly and Magdalene Christian Bogenschutz. Frank Kastly was born circa 1862 at Wisconsin. He was the son of Jacob Kastly and Magdalene Christian Bogenschutz. Helen M. Ohrt was born on 25 May 1909 at Nebraska. She was the daughter of Fred Ohrt and Anna Fedde. [S244] U.S. Federal Census 1910 U.S. Federal Census, by Ancestry.com, Year: 1910; Census Place: Jefferson, Douglas, Nebraska; Roll T624_845; Page: 9A; Enumeration District: 102; Image: 293. George Ohrt was born on 18 February 1842 at Holstein, Prussia. He married Magdalene C. Auch, daughter of George Auch and Margaretha Rohwer, on 25 July 1872 at Washington, Nebraska. George Ohrt married Catharina (?) circa 1884. George Ohrt died on 28 July 1910 at age 68. Intends to return in 4 months. [S246] U.S. Federal Census 1880 U.S. Federal Census, by Ancestry.com, Year: 1880; Census Place: Richland, Washington, Nebraska; Roll T9_756; Family History Film: 1254756; Page: 208.2000; Enumeration District: 33; Image: 0779. [S245] U.S. Federal Census 1900 U.S. Federal Census, by Ancestry.com, Year: 1900; Census Place: Jefferson, Douglas, Nebraska; Roll T623_925; Page: 4A; Enumeration District: 104. [S244] U.S. Federal Census 1910 U.S. Federal Census, by Ancestry.com, Year: 1910; Census Place: Jefferson, Douglas, Nebraska; Roll T624_845; Page: 1B; Enumeration District: 102; Image: 308. Married Name 25 July 1872 As of 25 July 1872,her married name was Ohrt. Magdalene C. Auch was born on 29 April 1848 at Prussia. She was the daughter of George Auch and Margaretha Rohwer. Magdalene C. Auch married George Ohrt on 25 July 1872 at Washington, Nebraska. Magdalene C. Auch died on 15 March 1884 at age 35. George Auch was born on 25 April 1818 at Germany also reported as Apr 1817. He married Margaretha Rohwer circa 1846. George Auch died after June 1900. George Auch and Margaretha Rohwer immigrated in 1885. Married Name circa 1846 As of circa 1846,her married name was Auch. Margaretha Rohwer was born on 28 March 1827 at Germany. She married George Auch circa 1846. Margaretha Rohwer died after June 1900. Margaretha Rohwer and George Auch immigrated in 1885. Margaretha Rohwer had 12 with 2 living in 1900 children. John Auch was born in June 1857 at Germany. He was the son of George Auch and Margaretha Rohwer. John Auch married Sophia (?) circa 1890. John Auch died after May 1910. [S244] U.S. Federal Census 1910 U.S. Federal Census, by Ancestry.com, Year: 1910; Census Place: Richland, Washington, Nebraska; Roll T624_855; Page: 11B; Enumeration District: 144; Image: 1487. Married Name 1892 As of 1892,her married name was Thomsen. Helena Auch was born on 5 August 1859 at Germany. Helena Auch married Claus Thun before 1885. Helena Auch married Carl Thomsen in 1892. Helena Auch died on 5 February 1894 at Washington, Nebraska, at age 34. Claus Thun was born on 15 May 1841 at Germany. He married Helena Auch, daughter of George Auch and Margaretha Rohwer, before 1885. Claus Thun died in March 1907 at age 65. George Auch Thun was born on 22 March 1885 at Washington, Nebraska. He was the son of Claus Thun and Helena Auch. George Auch Thun married Marie D. Mordhorst after 1900. George Auch Thun died on 14 May 1938 at Washington, Nebraska, at age 53. Carl Thomsen married Helena Auch, daughter of George Auch and Margaretha Rohwer, in 1892. Married Name after 1900 As of after 1900,her married name was Thun. Marie D. Mordhorst was born in March 1887 at Germany. She married George Auch Thun, son of Claus Thun and Helena Auch, after 1900. Name Variation Arline Jane Colwell was also known as Jane Arline. Married Name circa 1882 As of circa 1882,her married name was Pickler. Arline Jane Colwell was born in April 1861 at Iowa. She married Wilford S. Pickler, son of George A. Pickler and Jane Elizabeth Allen, circa 1882. 1885 West Point, Cuming, Nebraska Arline Jane Colwell appeared on the census of 1885 in the household of Wilford S. Pickler at West Point, Cuming, Nebraska. Arline Jane Colwell had 6 with 5 living in 1900 children. [S245] U.S. Federal Census 1900 U.S. Federal Census, by Ancestry.com, Year: 1900; Census Place: Cleveland, Holt, Nebraska; Roll T623_930; Page: 5A; Enumeration District: 113. [S244] U.S. Federal Census 1910 U.S. Federal Census, by Ancestry.com, Year: 1910; Census Place: Des Moines Ward 1, Polk, Iowa; Roll T624_419; Page: 3B; Enumeration District: 78; Image: 205. Mabel L. Pickler was born in January 1887 at South Dakota. She was the daughter of Wilford S. Pickler and Arline Jane Colwell. Name Variation Ernest Pearl Pickler was also known as Earnest. Ernest Pearl Pickler married Genevive Hotka, daughter of Michael Hotka and Barbara Kolin (?). Ernest Pearl Pickler was born in April 1888 at South Dakota. He was the son of Wilford S. Pickler and Arline Jane Colwell. Ernest Pearl Pickler and Genevive Hotka were divorced before 1925. Cecil F. Pickler was born in December 1889 at South Dakota. Cecil F. Pickler and an unknown person were divorced before 1930. Cecil F. Pickler was a attorney, general practice in 1930. Name Variation Ethyl Jane Pickler was also known as Ethel Jane. Ethyl Jane Pickler was born in April 1893 at Nebraska. Married Name 29 April 1914 As of 29 April 1914,her married name was Phelan. Anna M. Sweeney was born circa 1888 at Naugatuck, Connecticut. She was the daughter of W. J. Sweeney and Mary A. Cruse. Anna M. Sweeney married Dennis Edward Phelan Jr., son of Dennis Phelan and Elizabeth Quinn, on 29 April 1914 at Helena, Lewis and Clark, Montana, They were married by a catholic priest and witnesses were Blanche Davenport and Edward J. Dowers. W. J. Sweeney married Mary A. Cruse. Married Name Her married name was Sweeney. Mary A. Cruse married W. J. Sweeney. John Charles Schoenleben was born on 31 December 1885 at Chicago, Cook, Illinois. He was the son of John M. Schoenleben and Katherine Beening. John Charles Schoenleben married Leonore Josephine Klemme, daughter of Friedrich Christoph Albert Gustav Klemme and Catharina Caroline Wilhelmine Noehren, circa 1919. John Charles Schoenleben died on 16 August 1941 at Chicago, Cook, Illinois, at age 55. He was buried on 19 August 1941 at Acacia Park, Norwood, Cook, Illinois. [S243] U.S. Federal Census 1920 U.S. Federal Census, by Ancestry.com, Year: 1920; Census Place: Chicago Ward 23, Cook (Chicago), Illinois; Roll: T625_334; Page: 1B; Enumeration District: 1281. [S250] U.S. Federal Census 1930 U.S. Federal Census, by Ancestry.com, Year: 1930; Census Place: Chicago, Cook, Illinois; Roll: 496; Page: 10A; Enumeration District: 1962; Image: 937.0; FHL microfilm: 2340231. [S373] U.S. Federal Census 1940 U.S. Federal Census, by Ancestry.com, Year: 1940; Census Place: Chicago, Cook, Illinois; Roll: T627_1015; Page: 6A; Enumeration District: 103-2981. Married Name Her married name was Pickler. Genevive Hotka married Ernest Pearl Pickler, son of Wilford S. Pickler and Arline Jane Colwell. Genevive Hotka was born circa 1896 at Iowa. She was the daughter of Michael Hotka and Barbara Kolin (?). Genevive Hotka and Ernest Pearl Pickler were divorced before 1925. Michael Hotka married Barbara Kolin (?). Michael Hotka was born circa 1853 at Bohemia. Married Name Her married name was Hotka. Barbara Kolin (?) married Michael Hotka. Barbara Kolin (?) was born circa 1864 at Bohemia. Henry Pickler was born circa 1884. 1885 West Point, Cuming, Nebraska Henry Pickler appeared on the census of 1885 in the household of Wilford S. Pickler at West Point, Cuming, Nebraska. Fred H. Yamashita was born on 25 August 1922 at Hawaii. He married Addie G. Gold on 23 May 1960 at New Haven, New Haven, Connecticut. Fred H. Yamashita died on 27 January 2010 at age 87 Fred H. Yamashita, 87, died Wednesday, Jan. 27, 2010. He was the beloved husband of Addie Yamashita. He was born in Waimanalo, Hawaii, Aug. 25, 1922. Fred proudly served in the U.S. Army during World War II. He then went on to graduate from the Culinary Institute of America in New Haven. He retired from Masonic Home in 1986. Fred is survived by his three daughters, Brenda Niemann and husband, Darrell, Karen Yamashita, Janice Breininger and husband, Steven; son, Fred H. Yamashita, Jr; and predeceased by Anthony Yamashita. Fred is also survived by six grandchildren; and two great-grandchildren. In lieu of flowers donations can be made in his memory to the State Department of Veteran Affairs, 287 W.St. Rocky Hill, 06067. Funeral services will be privately held. Thomas Manville was born on 12 March 1907 at Wisconsin. He married Bessie Koska circa 1927. Thomas Manville died in May 1975 at age 68. Thomas Manville obtained US Social Security Card at Wisconsin; last residence La Valle, Sauk, Wisconsin. [S250] U.S. Federal Census 1930 U.S. Federal Census, by Ancestry.com, Year: 1930; Census Place: Cudahy, Milwaukee, Wisconsin; Roll 2584; Page: 3A; Enumeration District: 339; Image: 305.0. Married Name circa 1927 As of circa 1927,her married name was Manville. Bessie Koska was born on 13 April 1903 at Illinois. She married Thomas Manville circa 1927. Bessie Koska died in September 1983 at age 80. Bessie Koska obtained US Social Security Card at Wisconsin; last residence La Valle, Sauk, Wisconsin.